These blusher/highlighter hybrids leave cheeks with a natural looking flush that never looks overdone. These's also a great selection of shades and the packaging is beautiful. Almost to pretty to use! I love rings with delicate bands, they look so flattering when worn. This one would work equally well with a jeans and tee as it would with an evening dress. A plain black jumper is a staple in everyone's wardrobe but why not get someone a really nice quality one that will last. This cozy mohair one from whistles is really well made and feels a little bit more luxe. 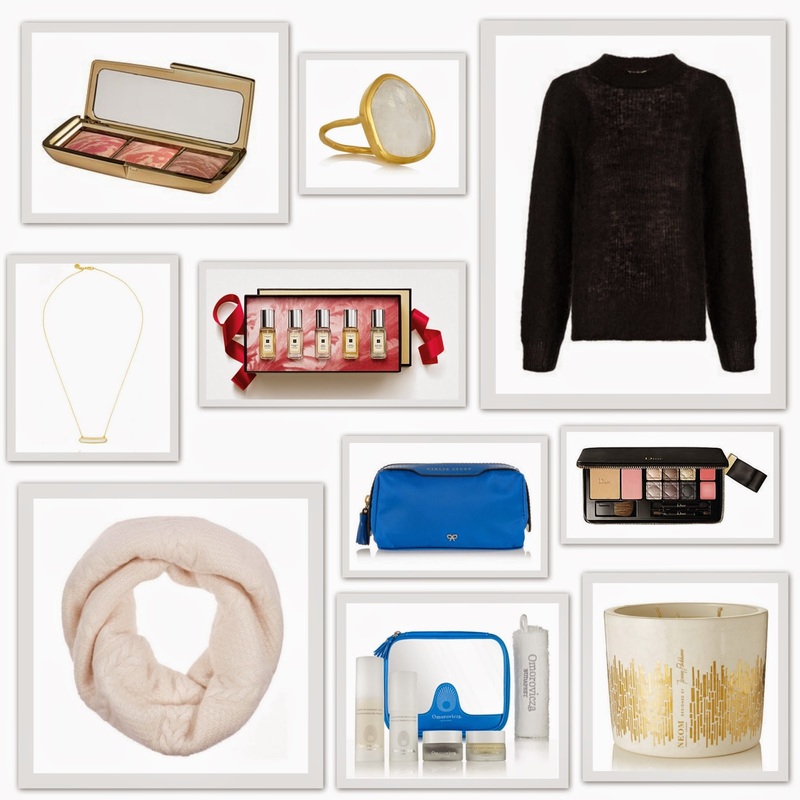 What would a p&p gift guide be without a delicate gold necklace? This one has a pretty rectangular agate and would make a great addition to anyone's jewellery collection. Jo Malone fragrances are such a luxury, and when combined the possibilities are endless. I think a lot of people would love the idea of being able to wear their own unique scent, this mini cologne set would be a great way to do that. It's also a great way of trying a few of their scents before investing in a full sized bottle. I love the bright royal blue shade of this little bag, perfect for stuffing with makeup and 'girlie stuff' and throwing into your handbag. This is definitely a palette that any beauty addict will swoon over, it has a selection of 6 eyeshadows, a lipstick, a lip gloss, a blusher and a face powder all in a beautiful zip up wallet. Cosy winter warmers always go down well at christmas and this cashmere snood would be a real treat. The neutral knit and colour means it will be worn and loved for many winters to come. This skincare set is definitely one for someone who already loves high end skincare but wants to try something even more special. It has a great range of their most popular products and is a great way to try them all before investing in the (very expensive) full sized versions! This beautiful, limited edition candle has notes of white neroli, mimosa and lemon as well as freshly cut grass. Perhaps not the most seasonally appropriate but the ceramic vessel and 18k gold guilding designed by Jenny Packham is just to good too pass up! I hope you liked this gift guide, if you fancy seeing my under £50 and under £25 edits you can see them here and here. Have any of these items made their way onto your wish list? The Hourglass Ambient blush palette is on my wish list! It's so nice! I saw the mini from Jo Malone and resisted to buy them. They're just perfect to try out new scents or to travel! It's on my wish list too, all the shades look so pretty!! the palettes look really lovely, hope you had a nice christmas!